My limited edible gardening produces just enough to keep me interested. 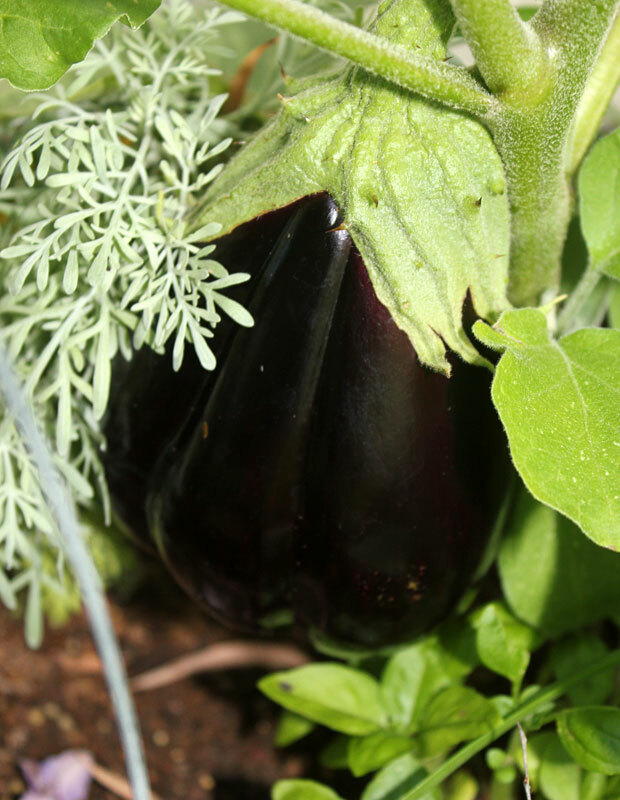 I like to try new things to see how they grow here and this month I’m having great fun with the Brinjal “Black Beauty” I planted recently. 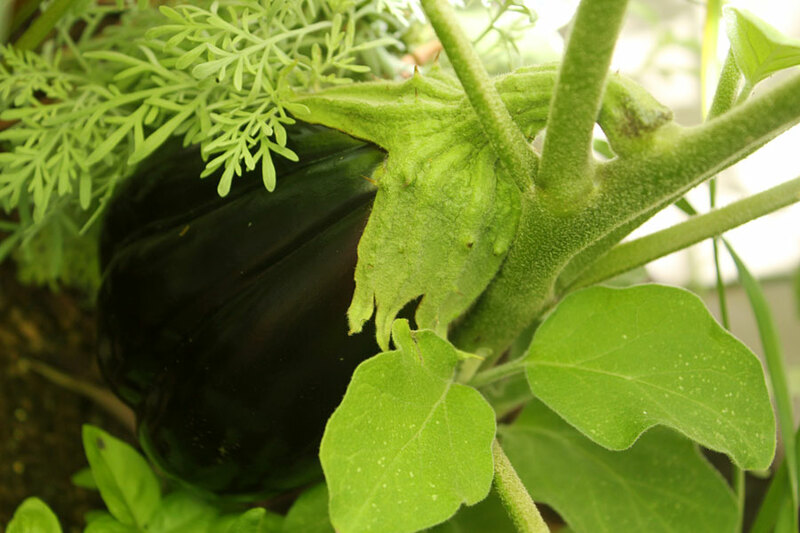 It’s obviously in an ideal spot because it produced flowers almost immediately and the first Brinjal is almost ready for picking. I think I could pick it now but I’d like it to get a bit bigger – apparently the right time to pick is when it’s almost the size of my hand (it’s the size of my closed fist now, so not long to go). This week I read somewhere that Brinjals (Aubergine or Eggplant) like to be positioned where they have lots of space and against a warm wall. No wonder mine is doing so well. That’s exactly where I planted mine – in a very deep, large pot that stands against a warm wall. In other January Garden Bloggers harvest day news, I have so much Basil again that I’ve made my own Basil Pesto. 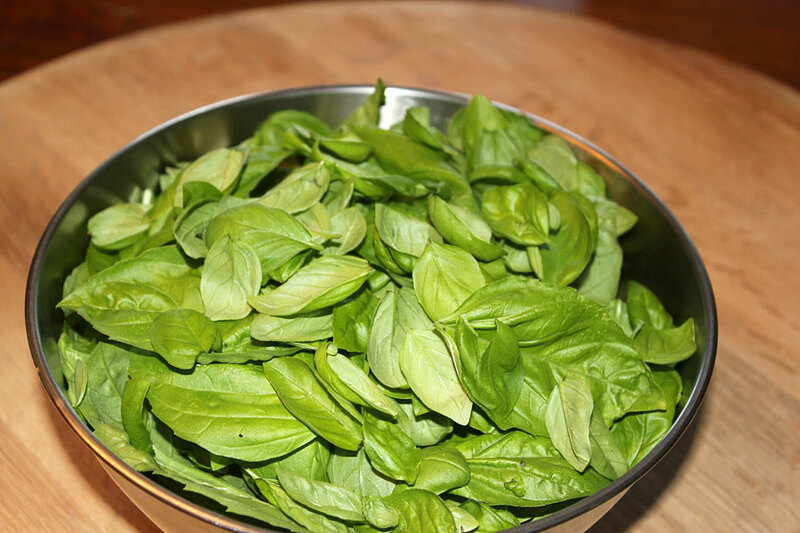 The lovely small leafed Basil (called Basil Minuet) is wonderful freshly picked in salads. 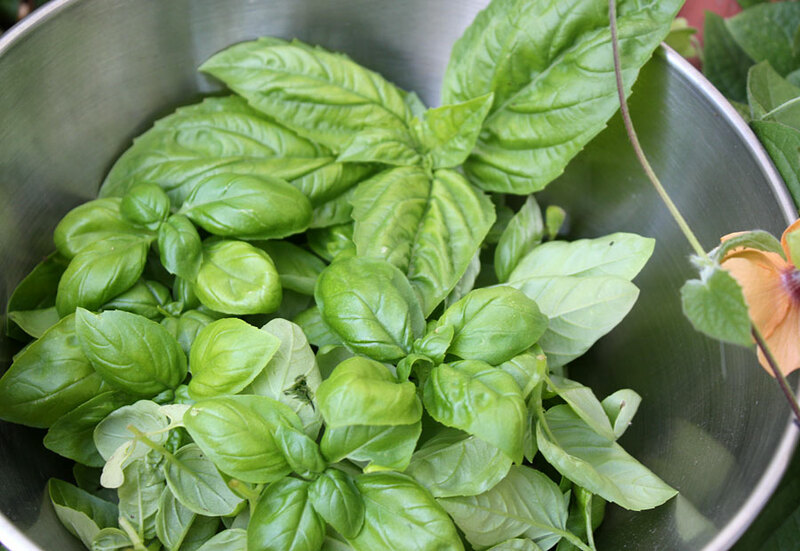 It has a less pungent flavor than the ordinary Basil which makes it perfect for eating freshly picked. I prefer the ordinary Basil for making Pesto. So I grow both and hope I can keep getting seedlings of the Minuet.After picking all the lovely leaves it takes about 7 to ten days and they are ready for picking again (depending of course on how much I need). And so far its been bug-free! I love this variety. I’m still picking Rosemary, lots of Thyme and am loving the Wild Rocket (Arugula). I need to get more of them, two plants are not enough for us. A quick update – I prepared this post two days ago, and today was able to harvest the now larger-than-my-hand sized Brinjal! What are you harvesting or growing this month? Please join us for Garden Bloggers Harvest Day, we’d love to see what you are growing or harvesting! I am going to try starting a small garden for the 3rd time once the baby is born, so this is a great inspiration. Your produce turned out amazing! Everything looks so fresh and beautiful. Based on your blog, I think it will be good to start small with a few herbs and work my way up. Oh WOW!! look at that eggplant!! Mine has only flowered. Can’t wait to see if mine will grow as beautiful as yours. The warm wall is a must then. The basil also looks delish! Hi Christine, I also like to try my hand at new stuff, and last year was to be the one when I wasn’t just going to be seen as an ornamental gardener. However I could not have chosen a worse year for my experimentation with veg. It was the most miserable Summer on record, I mean veg growing in the North East Of Scotland is a challenge at the best of times. Seriously impressed with your Aubergine. Harvesting herbs indoors and just planted greens…my eggplants grew in grow bags on my patio. I am planting them close to peppers and okra next year…a veg gardener friend swears this is the way to go…we shall see. I will remember the warm wall which is like my warm brick patio. We have plums, ripe and dripping juice! Basil pesto sounds wonderful! And that eggplant (what I know it as) looks beautiful! 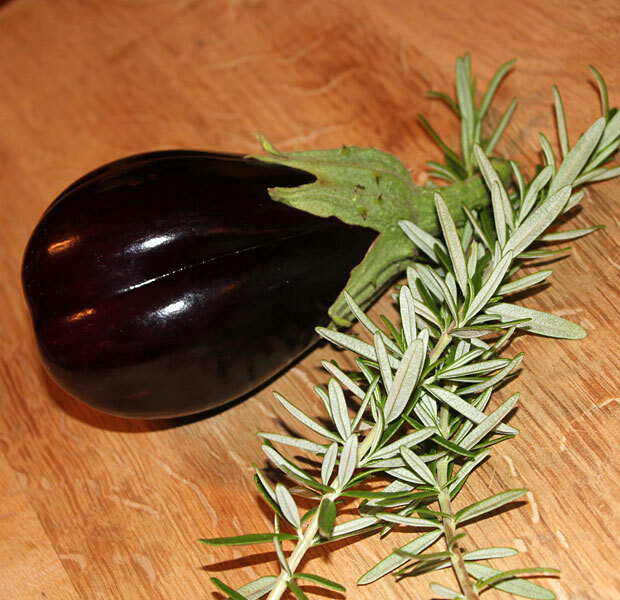 I love to grow eggplant, but am always a bit bewildered on the best way to cook it. This also reminds me that I should do something like this on my deck next year. 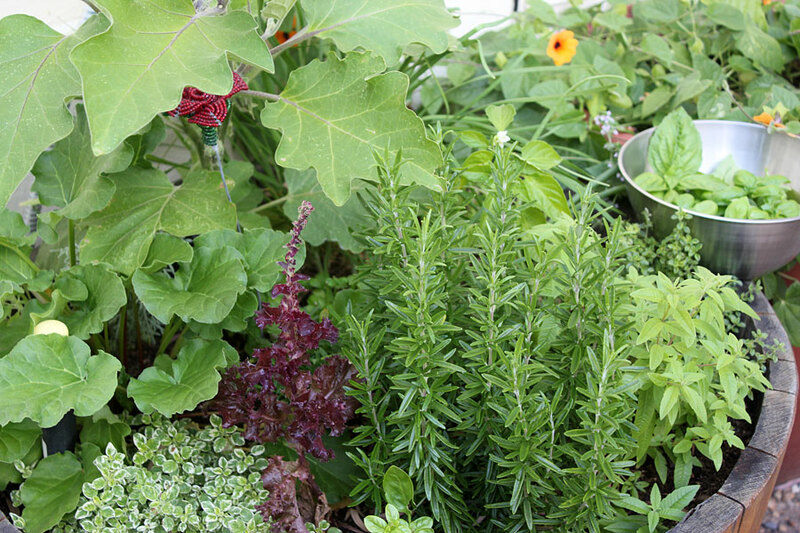 Right now my herbs are all scattered throughout the garden, which makes just-in-time harvesting really bothersome.